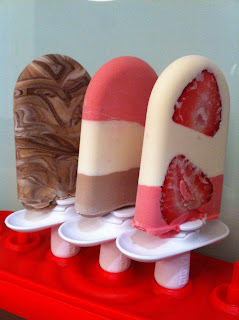 zoku ice pops | what is clara eating today? i was told that i cannot use any non-sugar juice or cream based drinks to make the pops using zuku quick pop maker… so i was very disappointed. but when i found the zoku on sale, i just had to try it myself… and you know what? it works! clara loves these for dessert, and loves to help out pick the flavors and make them! if you don’t have a zoku ice pop maker, you can use a mini paper cup and pop stick and freeze overnight and simply peel off the paper cup by running the outside in hot water for a few seconds. this is the base recipe, but you can mix in crushed frozen berries, yogurt, etc. be creative and have fun making patterns with your child!